Stainless Steel 316 Ferrule Fittings, SS UNS S31600 / S31603 Double Ferrule Fittings Suppling at Qatar, Stainless Steel 316 Ferrule Fittings, SS 316L Union Tee, Stainless Steel 316 /316L Male Connector Manufacturing at Spain, SS 316 / 316L Female Elbow Suppling at Egypt , SS 316L Bulkhead Union Supplier & Exporter in Mumbai India. Alpha Overseas supplies SS 316 / 316L Compression Tube Fittings, which has higher creep resistance. Stainless Steel 316 Compression Tube Fittings is suitable for welding because it has carbon content lower than 301 to 303 series alloys to avoid carbide precipitation in welding applications. Concentrations of salt in seawater can vary in SS 316 Ferrule Fittings, and splash zones can cause concentrations to increase dramatically from the spray and evaporation. The molybdenum gives Alloy 316 Double Ferrule Fittings better overall corrosion resistant properties than Grade 304, particularly higher resistance to pitting and crevice corrosion in chloride environments. 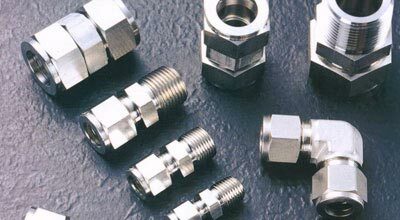 Grade 316 Tube Fittings is extensively used in the oil and gas and chemical industries for its cost effective corrosion resistance and ease of fabrication. Marine grade stainless steel, called as 316 Stainless Steel Compression Tube Fittings, is resistant to certain types of interactions. 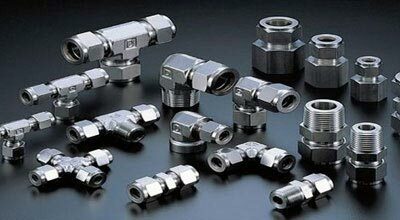 Stainless Steel 316L Compression Tube Fittings is an extra low carbon version of stainless steel 316. The low carbon content in SS 316L Tube Fittings reduces susceptibility to carbide precipitation during welding. In addition, Alloy 316L Ferrule Tube Fittings provides excellent elevated temperature tensile, stress-rupture and creep strengths, as well as outstanding weldability and formability. 316 Stainless Steel Male Adapter, SS DIN 1.4404 / 1.4435 Compression Tube Fittings Suppling at Indonesia, ASTM A182 Tube Fittings Manufacturer, Stainless Steel 316L Female Branch Tee, SS 316 / 316L Straight Union Manufacturing at Tanzania, Stainless Steel 316 / 316L Reducing Union, SS 316 Bulkhead Lock Nut Manufacturer & Stockist in Mumbai, India. 316L Stainless Steel Tube Fittings also offers higher creep, stress to rupture and tensile strength at elevated temperatures, in addition to excellent corrosion resistance and strength properties. The austenitic structure in Grade 316L Double Ferrule Fittings also gives these grades excellent toughness, even down to cryogenic temperatures. Thread : NPT, BSP, BSPT, UNF, ISO, SAE etc. ASIA : UAE , SAUDHI ARABIA , OMAN , KUWAIT , BHARAIN , QATAR , JORADAN , ISRAEL , SRILANKA , MALAYSIA , SINGAPORE , BRUNEI, INDONESIA , PHILIPPINES , RUSSIA , TURKEY . AFRICA : EGYPT , TANZANIA , SOUTH AFRICA , MOROCCO , ALGERIA , TUNISIA . EUROPE : FRANCE , SPAIN , ITALY , CROATIA , AUSTRIA ,SLOVAKIA , NETHERLAND , CZECHIA , PLOAND , GERMANY , BELGIUM , ALBANIA , SLOVENIA . We are Exporter of Stainless Steel 316 Tube Fittings in Worldwide Such as Libya, Indonesia, Mexico, Hong Kong, South Korea, Thailand, Hungary, Czech Republic, Canada, Ghana, Chile, Belarus, Kenya, Estonia, Iran, Colombia, Bulgaria, Oman, India, Poland, Chile, Bahrain, Mexico, New Zealand, Egypt, Trinidad & Tobago,Tunisia, Bangladesh, Ecuador, Gambia, Denmark, Portugal, Finland, Ireland, Germany, Nigeria, Nigeria, Lithuania, Gabon, Switzerland, Malaysia, Costa Rica, Israel, Saudi Arabia, United Arab Emirates, Lebanon, Zimbabwe, Peru, Bhutan, Taiwan, Croatia, Ukraine, Philippines, France, Mongolia, Netherlands, Nepal, South Africa, Qatar, Italy, Angola, Pakistan, Iran, Bolivia, Sri Lanka, Afghanistan, Serbia, Kuwait, Vietnam, Japan, Singapore, Iraq, Sweden, Argentina, Austria, Greece, Morocco, Namibia, Slovakia, Jordan, Brazil, Tibet, Venezuela, Norway, Belgium, Australia, Puerto Rico, Azerbaijan, Russia, Algeria, United States, Yemen, Romania, Poland, United Kingdom, Turkey, Spain, Kazakhstan, Macau, China. We are Suppliers of Stainless Steel 316L Compression Tube Fittings in India Such as Granada, Ankara, Indore, Ludhiana, Los Angeles, Petaling Jaya, Howrah, Jeddah, Sharjah, Busan, Navi Mumbai, Singapore, La Victoria, Courbevoie, Atyrau, Algiers, Santiago, Madrid, Bengaluru, Jamshedpur, Karachi, Haryana, Secunderabad, Thiruvananthapuram, Calgary, Riyadh, Faridabad, Houston, Montreal, Dallas, Vung Tau, Al Khobar, Ahvaz, Kanpur, Baroda, Gurgaon, Moscow, Melbourne, Ho Chi Minh City, Hong Kong, Thane, Lagos, Chiyoda, New York, Edmonton, Toronto, Sydney, Doha, Pune, Pimpri-Chinchwad, Istanbul, Mumbai, Brisbane, Seoul, Bogota, Milan, Tehran, Port-of-Spain, Cairo, Mexico City, Hanoi, Perth, Coimbatore, Bhopal, Abu Dhabi, Lahore, Caracas, Al Jubail, Kuwait City, Rio de Janeiro, Dammam, Colombo, New Delhi, Nagpur, Aberdeen, Geoje-si, Dubai, Ahmedabad, Jakarta, Muscat, Noida, Chandigarh, London, Gimhae-si, Hyderabad, Chennai, Ulsan, Manama, Ranchi, Nashik, Rajkot, Visakhapatnam, Surat, Kuala Lumpur, Kolkata, Bangkok, Vadodara, Jaipur, Ernakulam.